The Poetry Machine (also known as Ink After Print and Blæk) is an interactive, participatory, digital literary installation made in a collaboration between PIT-researchers at Aarhus University, CAVI/Tekne Productions and Roskilde Libraries initiated during the Literature Takes Place (Litteraturen Finder Sted) project and first exhibited in 2012 and further developed in the Creative Europe project Turn On Literature, http://www.turnonliterature.eu/, with Roskilde, Bergen and Antim Ivireanul Valcea County Libraries in Denmark, Norway and Rumania. The Poetry Machine is designed to make people affectively engage with, and reflect on, the ergodic qualities of digital literature in public settings such as libraries and events. Through their engagement with The Poetry Machine, people can – individually or collaboratively – produce poems by interacting with three books embedded with a sensor system. The interactive books let people control a floating sentence in an ocean of words toward a sheet of paper to produce a poem, all visualized on a large display. The sentences are retrieved from a database. When the poem reaches a set limit, it is printed out in a form similar to a library receipt that people can take with them. The poems also appear on a blog updated in real-time, where people can read their own and others’ poems, and comment on them. 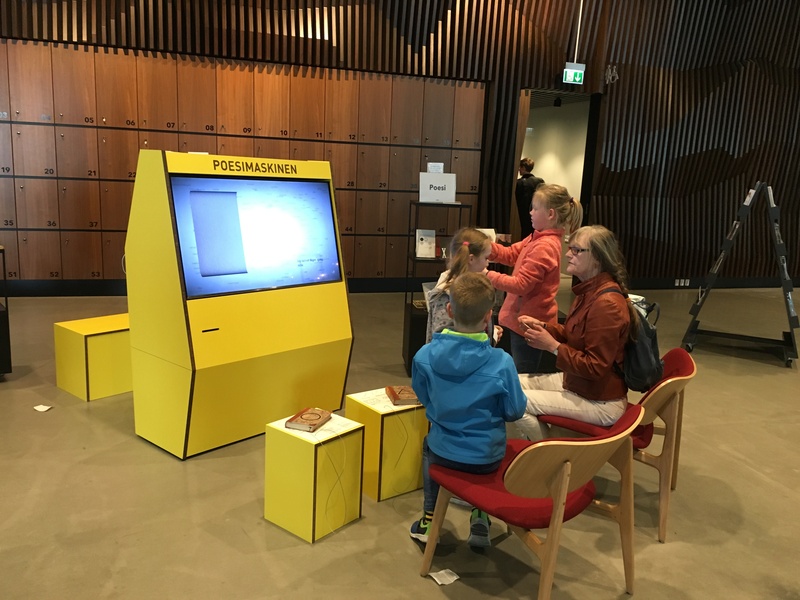 The Poetry Machine has been exhibited at many libraries across Denmark, at numerous conferences and seminars and at Roskilde Festival, and several thousand poems has been produced. Furthermore, it has been exhibited by the libraries in Bergen and Antim Ivireanul Valcea County, who also host versions of it. Finally, has also been presented and exhibited at international conferences in e.g. Bergen, Edinburgh, Paris, Coventry, Bremen and at Electronic Literature Organisation Conferences in Milwaukee, Porto and Montreal. The Poetry Machine was first build in Danish as Tilfældigvis er skærmen blevet blæk (Accidentally, the Screen Turns to Ink). The Danish website can be found here: http://blaek.netlitteratur.dk/. Later it was developed by the It is hosted at Roskilde Library and can be borrowed by public libraries. It has gradually become a platform and texts for The Poetry Machine has been written by Peter-Clement Woetmann, Ursula Andkjær Olsen (Danish), Radu Vancu (Romanian), Morten Langeland (Norwegian) and Yan St-Onge and Benoit Bordeleau (French-Canadian/Quebec). Most texts have also been translated into English and some into French. The English version of Ink is hosted by CAVI and is planned to be used for new development and experimentation within the PIT and Literature Between Media research projects. Peter-Clement Woetmann: 105 Variationer, Arena, 2015. Pold, Søren Bro and Christian Ulrik Andersen. “Post-digital Books and Disruptive Literary Machines: Digital Literature Beyond the Gutenberg and Google Galaxies”. Formules/Revue Des Creations Formelles. 2014. Translators: Morten Visby, Emilie Barbier and others.